I’ve been following Ojisanjake’s enthralling blog about the hidden gems of unfamiliar Japan for since its inception back in 2007. During that time, there were only a handful of on-line sites focusing on the beauty of rural Japan, and the timeless images and attentive descriptions struck a chord with my prolific excursions deep into Japan’s mountains. Our correspondence has continued to this day, and Kanako and I have even visited his tiny hamlet sitting snugly against the rugged mountains of Shimane Prefecture. 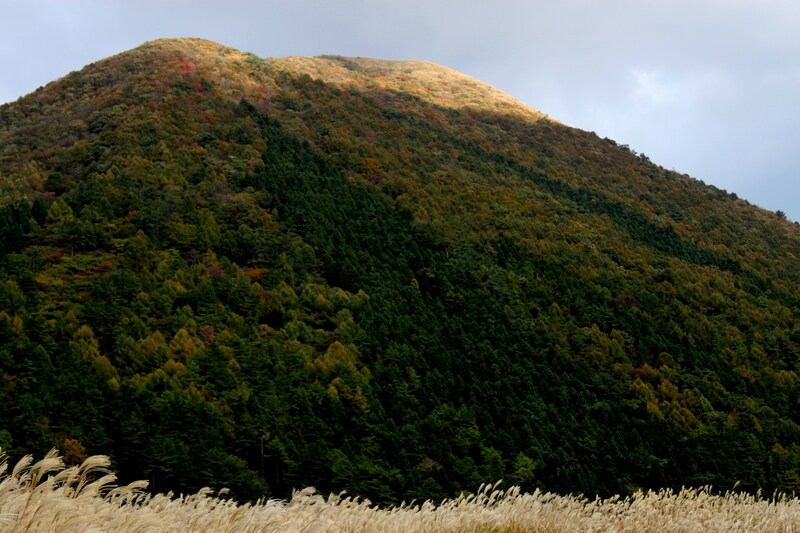 However, we had yet to do a walk together until I mentioned a desire for an autumn climb of Mt. Sanbe, an ancient volcano sitting literally in Jake’s backyard. The freewheelin’, mask-making wanderer used this trip as an opportunity to visit a few temples on the Iwami 33 Kannon Pilgrimage route before making a late afternoon ascent on Sanbe’s conical slopes. I spent most of the chilly autumn day just getting to the trailhead. The cheetah dashes of a Shinkansen train whisked me along to Okayama station, where a turtle’s crawl through the interior of the prefecture spit me out nearly 4 hours later in Oda city. I retreated to the nicotine-stained walls of a local coffee shop for a late lunch of curry and rice before boarding the bus to the starting point of the hike: the particular bus I boarded stopped at all four approaches to the volcanic massif, but I chose to assault the peak from the southwest, unaware that my companion was trudging up the switchbacks on the opposite side of the mountain. The bus stop was home to a modest visitor’s center and restaurant, as well as a parking lot full of cars. In the fields of susuki grass just across the road, dozens of junior high school students meandered through the maze in a dress rehearsal for the following day’s sports festival. Since there were no water sources on the mountain, I set off in search of that nourishing mixture of two parts hyrogen, one part oxygen that would sustain me for the next couple of days. The faucets of the restroom warned visitors not to partake of the tap water in these parts, so I shuffled through the gear, feeding 1000 bills into the vending machines until I had small arsenal of 500 ml bottles that I clumsily strapped to my 40-liter rucksack. Time check: 4pm and counting. I ducked in and out of the overgrown grass like a soldier on a combat mission, pausing to let the students pass by on their training runs. The fields petered out into a radiant canopy of deciduous trees ablaze in color. The late afternoon sun filtered through the leaves, creating soft patches of gold on the green quilt of the forest floor. I worked my way through the switchbacks that climbed to meet the setting sun. Each turn in the trail affording sneak peeks of the endless folds of mountains fading away to the horizon as the winds pushed in from the north. As the forests gave way to grasslands I sat perched on an bald patch of rock, emptying one water bottle while forcing an almond-and-chocolate concoction down my esophagus in an attempt to kick start the engines. I was pooped from the nearly relentless climb and hoped to beat the setting sun to the summit. The angle abated, spitting me out into a vast volcanic plateau of golden grass and rolling plains. I spotted a lone figure strolling on the summit directly in front of me. “Jake”, I shouted, jarring the figure out of his transfixed pose as I quickened the pace to greet my long-awaited companion. It turns out he had beat me to the summit by mere minutes as we took in the spectacle of light spreading out to the west. On the exposed tips of the 1100-meter high perch, dark cloud and fiery gusts flowed unimpeded from the Sea of Japan coast, a warning that foul weather was about to overtake our position. Our plans for an open bivy were abandoned in favor of the pristine and deserted emergency hut a few minutes stroll from the high point. We sought refuge, arriving just seconds before the heavens opened up. Praising our impeccable timing, we rolled out the sleeping gear while boiling water for dinner. The rain quickly turned to sleet, bouncing off the tin roof like gravel ricocheting through the spokes of a bicycle. We checked the progress of the stubborn tempest every few hours, as the ice started settling on the veranda of the hut. Occasionally the racket would subside as the sleet turned to snow, only to return a few minutes later with even greater vengeance. What Sanbe had done to piss off mother nature we never knew, but we thanked our lucky stars for the kind saint that built the summit hut in what was turning out to be a potential emergency. Sometime during the night the storm passed, leaving a stillness that sat heavy in the early morning hours. At daybreak we were a bit anxious to open the door to see what present the storm had left for us. Our anxiety turned to relief when finding only a few centimeters of accumulation in the pre-dawn fog that enveloped the mountain. Patches of blue sky faded in and out of the white mess. I boiled water for hot drinks and prepared to meet the coming day. Leaving the kit behind, we strolled up to the high point to be met by the awakening rays of first light shimmering off a sea of white cloud floating above the gilded valleys below. We spent the next hour or so racing from peak to peak, looking for the perfect vantage point to capture the dazzling light show laid out before us. Though pictures can capture the scenery, there are no words to describe the feelings of peace and joy flowing through our veins in the stillness of the soft November air. Once the best of the early light had passed, we ate a few nibbles of nourishment before shouldering the packs and dropping off the northern face to a mountain pass just below the dormant cinder cone of Mt. Ko-Sanbe. Jake let out curses cloaked in a thick Welsh draw during the hour-long knee knocking descent as I forged a trail through the crimson forest down the path of least resistance. Both of us were relieved to find the trail a bit more manageable at the junction, where we slipped down to the open fields that I had tramped through the previous afternoon. We caught an early morning bus back to Oda and the slow train over to Gotsu, where I caught a few hours rest before attending an all-night Kagura festival deep in the mountains near Miyoshi in Hiroshima. All in all it was an invigorating outing in the volcanic highlands of rural Japan and a wonderful glimpse into the unfamilar Japan that Ojisanjake continues to introduce to avid readers of his influential blog. Once upon a time there stood an isolated shrine buried deep in the forest. Ancient stone steps carved a path through said forest to the doorstep of the sanctuary. A weary hiker dripping with sweat arrived one late June morning and sat transposed, admiring the scenery and contemplating the meaning of life. Nearby, a secluded grotto offered an even better place for reflection. Higher up in the hills, the hydrangea serrata offered fresh patches of brilliant blue among a crowd of verdant green. Still higher the traveler pushed, out of the cultivated cedar farms and onto a ridge untouched by the claws of development. The path curved a spiral through the bush and onto a narrow summit plateau punctuated by a large shrine. The trespasser paused, offering a rice ball to the kami sama churning inside his empty stomach before documenting the proof on a 12.1 megapixel rectangular digitized contraption. Further along the undisturbed ridge, beech trees presented themselves among the thick village of hardwoods. Claw marks provided a reminder that the solo traveler was never truly alone in these pristine highlands. A few turns down a seldom used path spit our hero onto a forest road bereft of traffic, which eventually funneled into a sleepy hamlet of traditional homes. Children splashed around in the trickling flow of the creek bed as the road grew in size. Manicured flowerbeds gave the eyes a visual break from the mountain of concrete engulfing the constricted valley. The narrow lane expanded into a dual-laned monstrosity, cars zipping by on the centimeter wide shoulder. Refuge was sought and delivered a few kilometers along the death trap, and eventually our star arrived at the doorstep of the JR Maizuru line, just in time to find the next available train a mere 90 minutes away. Reinforcements were called in, arriving disguised as a Nihon Kotsu taxi cab. Speeding through the back roads to Ayabe station, the explorer found yet another obstacle delivered as a one-hour layover until the next Kyoto bound train. Dejected yet undetermined, a visit to the local Family Mart revealed a hot spring bath located adjacent to the train tracks. Relief was gratefully delivered, as the squeaky-clean mountaineer finally boarded that train back to Osaka beaming with confidence that only one unscaled peak remained in Kyoto Prefecture. Unfortunately that peak would also require a monumental access headache on the same train line that gave our victor so much trouble this time around.